A good Marketing Strategy can accurately measure the effectiveness and efficiency of each campaign so that we can adjust and increase performance monthly. Platforms like Google Analytics, Google Adwords and Facebook Ads campaigns help us interpret the scope and effectiveness of the campaigns we develop online. But what happens when a conversion takes place outside the cyber world? If a Google Ads campaign produces a phone call from a phone extension, how can we measure and attribute that call to campaigns developed on Google. And even further, if that call produces a sale, how we co-relate it to the respective Google or Facebook campaign from which it came. That conversion is certainly offline. So, the fundamental question is, how do we measure and attribute offline conversions of phone calls? Infopaginas works with a call tracking platform that allows us to discover which marketing campaigns, websites, landing pages and keywords are generating telephone calls and conversions. 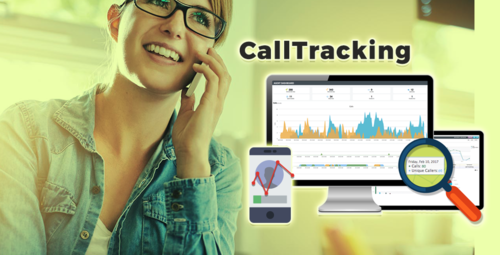 The call tracking software provides attribution at keyword level in Google and mobile click-to-call tracking, which allows us to obtain valuable data from the profiles of those people who call us and information from the marketing campaigns that generated those phone calls. This way we can track our potential customers both online and offline so we can maximize the possibility of each conversion. Call today for a free consultation and demonstration of this Call Tracking Software. We will give you a virtual tour of our administration panel so you can learn how to convert your analogue, digital or even your company's cell phones into a Virtual Phone System that you can manage from any computer, cell phone or tablet with internet access. 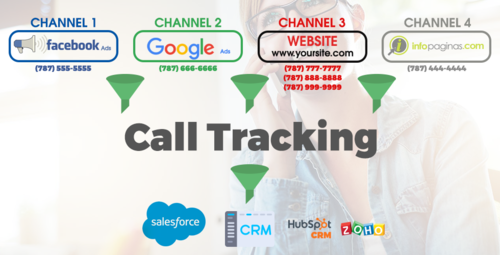 We offer integrations of our Call Tracking system with Google Analytics and Google Adwords. CRM Systems (Client Relationship Management) such as SalesForce, HubSpot and ZOHO.